More men than women are dying from malignant melanoma (MM), according to findings presented at the National Cancer Research Institute (NCRI) Cancer Conference held in Glasgow, United Kingdom. Dorothy Yang, MD, and colleagues conducted an observational analysis of the World Health Organization mortality database between 1985 and 2015, using International Classification of Diseases 9th and 10th editions codes for malignant melanoma to extract age-standardized death rates (ASDRs) for 33 countries with the most reliable data.1 These rates take into account the effects of some countries with an aging population and others with a younger demographic. Among all skin cancers, MM has the highest mortality, with incidence on the rise over the past decade, particularly in regions with pre- dominantly fair-skinned populations. Yang, a junior doctor at the Royal Free London National Health Service Foundation Trust, United Kingdom, and colleagues noted that mortality among men is on the rise in all but 1 of the countries observed. The exception was the Czech Republic, said Yang. That country demonstrated a single decreasing trend in mortality on analysis, with an estimated annual percentage decrease of 0.7% between 1985 and 2015. 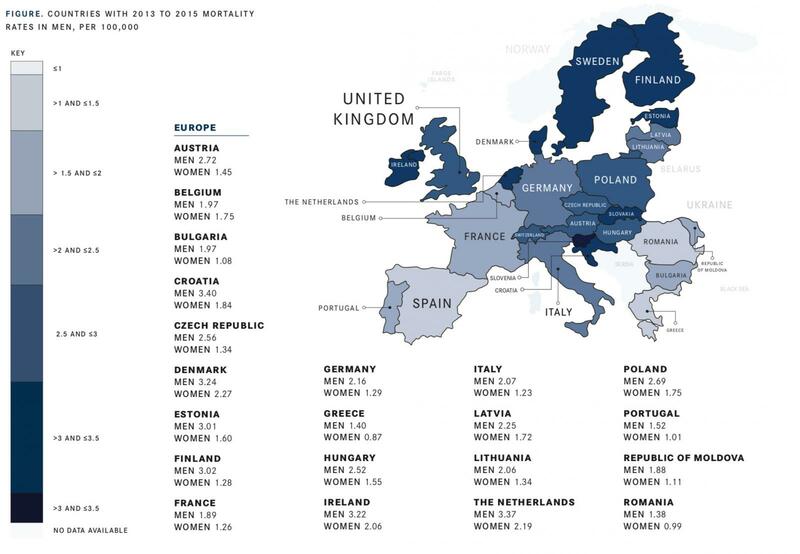 For women, Yang and colleagues saw decreasing or stable MM mortality, noting that Israel and the Czech Republic demonstrated the greatest percentage of decreases in mortality rates in women over the observation period. Observed mortality rates were –23.4% and –15.5%, respec- tively. In the United States, about 9320 people are expected to die from melanoma (about 5990 men and 3330 women), according to the American Cancer Society.2 Secrest and colleagues3 evaluated possible sociodemographic and healthcare-based predictors of differences in US melanoma survival using the melanoma mortality-to-incidence ratio (MIR). Their analysis showed that states with the highest incidence of melanoma (Oregon, Washington, Utah, Minnesota, Vermont and New Hampshire) have a better survival rate. Conversely, states with a lower incidence of melanoma (Texas, Louisiana, Alabama, Indiana, Illinois and Nevada) experience lower survival rates. The investigators found that for men and women, 3-year average ASDRs for 2013 to 2015 were highest in Australia and Slovenia and lowest in Japan; rates of death (per 100,000) were 5.72, 3.86, and 0.24, respectively, in men, and 2.53, 2.58, and 0.18, respectively, in women (FIGURE). “We wanted to conduct an up-to-date analysis of recent melanoma mortality rates across the world to try to understand these patterns and whether new diagnosis, treatment, and prevention strategies are having any effect,” Yang said in a release. Yang suggested that women are more likely to take precautionary measures to limit sun exposure and engage in melanoma awareness or prevention initiatives. “This research shows that death rates for melanoma are stabilizing or decreasing in some countries, particularly for women, but in almost all countries, there was an increase in death rates over the past 30 years in men,” said Poulam Patel, MD, chair of the NCRI Skin Cancer Clinical Studies Group and professor of Clinical Oncology at the University of Nottingham, United Kingdom. Yang D, Salciccioli J, Marshall D, Shalhoub J. Trends in mortality from malignant melanoma: an observational study of the World Health Organisation mortality database from 1985 to 2015. Poster presented at: 2018 National Cancer Research Institute Cancer Conference; November 4-6, 2018; Glasgow, UK. Abstract 1952. abstracts.ncri.org.uk/abstract/trends-in- mortality-from-malignant-melanoma-an-observational-study-of-the-world- health-organisation-mortality-database-from-1985-to-2015/. Key statistics for melanoma skin cancer. American Cancer Society website. cancer.org/cancer/melanoma-skin-cancer/about/key-statistics. html. Updated January 4, 2018. Accessed November 22, 2018. Hopkins ZH, Moreno C, Carlisle R, Secrest AM. Melanoma prognosis in the United States: Identifying barriers for improved care [published online ahead of print]. J Am Acad Dermatol. doi: 10.1016/j.jaad.2019.01.003.